Adrian Card is a historically-based decorative painter, who applies his talents to furniture, murals and interiors, harpsichords and other musical instruments and a curious, delectible miscellany. Although his studio is in San Francisco, he has clients across the country. His specialty is 17th and 18th century ornament and pigments, but he's adept at interpreting the ornament of just about any period in history, including the 21st century. "After majoring in printmaking at the Philadelphia College of Art and the San Francisco Art Institute, where I also enjoyed a wide variety of art history courses, I turned my attention to historically-based decorative painting. Each particular era has its own decorative language, with a corresponding grammar of curves and ornaments, a grammar that I freely adapt to suit the taste of the client and the decorative needs of the project. 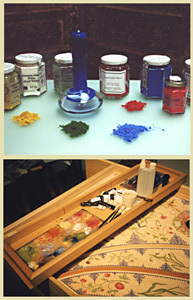 For harpsichord soundboard paintings, I use only the pigments which were available at the time, that are authentic for the period. Since many of these are no longer available as ready-made paints, I make my own paints using period recipes. Some of my pigments come from a working windmill in Holland which has been grinding artist's pigments since the 18th century." Clients and visitors are always welcome, and I'm always interested in discussing new and different ideas for projects. If you're going to be in the San Francisco Bay Area and would like to visit me and my studio, please drop me a line. "Adrian possesses an extraordinary talent for working in a variety of mediums and is a chameleon of style. 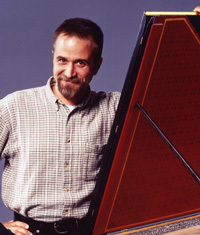 He has completed seven projects for me between 1999 and 2006 his work is consistently excellent. Adrian is always prepared for meetings with inspirational reference materials and ideas. He is sensitive and responsible about completing projects to the tastes and budget of the commissioner. He approaches each project with enthusiasm and I'm always delighted with his artistry." "I have viewed Adrian's work on multiple pieces. He is an exceptional talent and a truly gifted artist." 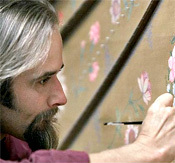 "Adrian has always been a gifted, and subtle painter. Over the years, he has become ever more original in the unique applications he finds for his work." "I have personally viewed a number of Adrian's paintings from wall paintings to harpsichords to eggs and have found the scope and breadth of his talents to be absolutely awesome." "Adrian card is an amazingly skilled painter, who specializes in using historic techniques and materials. he is sure-handed enough to paint even the most delicate detail on tiny surfaces; his murals are graceful and wonderful compositions. he's a true artisan who excels at his craft and is generous with his time and expertise." "Adrian's work is astonishing. Those fortunate to have seen his collection of painted Easter eggs--such exquisite, minuscule marvels of detail and design-- know that he is the unrivaled master of his art."